I spent time this weekend mapping out the trip to California I’m taking later this week. To put it mildly, it’s going to be epic. Very, very epic. California was the first place I lived all alone. With family and friends 1,000 miles away, I was forced to figure it out. To navigate places I’d never been. To search out good people. To make somewhere I never knew a home for myself. I guess for me, California is nostalgia. A special nostalgia that grips me unlike much else. I love nearly everything about it. I say “nearly,” because I don’t love the traffic. I don’t hate it either, though. Which is strange. LA traffic is unlike any other in terms of its density. Yet, there’s something oddly energizing and freeing about being trapped in it. If you can conquer it, you feel like you can do anything. Anything. The deeper I got into my trip planning, the deeper my heart yearned to be in California. I love Miami. I have the best job in the world. I have amazing friends. I live in the sickest condo. Really. Sometimes I pinch myself and wonder how I got so lucky to live here. But I still miss California. When I let myself think about it, I get sad that I haven’t felt crisp air once in Florida. I miss sitting on a towel in the sand watching waves crash against cliffs. I miss nature and exploring new places of beauty. 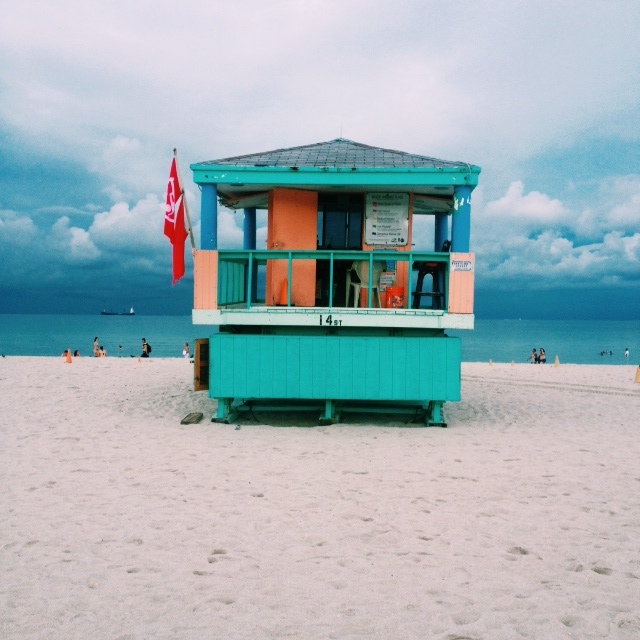 I miss beach towns–real beach towns with bars and kitschy shops and weird people. I miss the strange, free vibe that California sends out to the universe. I called my mom and said, “I miss California. I just really, really miss California.” And as I uttered the words, something hit me. I hadn’t even given Miami a fair shake at being California. Miami might not have crisp air. It may not have cliffs. In actuality, I’m pretty sure the highest point in Florida is a dump on I-95. I’m not even kidding about that. Miami will never be California. Realizing that was a bit of an “aha” moment for me. No, Miami will never be California. But what’s to say it doesn’t hold its own magic? What’s to say it can’t grip my heart even harder than California? There’s a quote from the Dalai Lama that reads, “Happiness is not something ready made. It comes from your own actions.” I’ve believed for a long time that happiness is a choice. In large part, we hold the keys to how we unlock the world around us. Will we choose to be happy? Will we choose to find joy? On Sunday, I decided to find joy in Miami. I decided to wake up early and hit the pavement and find a place in this city that grabbed my heart. And I did. A few years ago, I went to my favorite store in the world, Tuvalu in Laguna Beach, and ended up buying Anna Quindlen’s “A Short Guide To A Happy Life.” It’s a short book, so I read it all that night. And what I took away from it, is that a happy life is one that finds joy in the ordinary. A happy life is one that finds the greatest joy in the simplest pleasures. Like the colors of flowers. Or watching a baby learn how to walk. Or a call from an old friend. 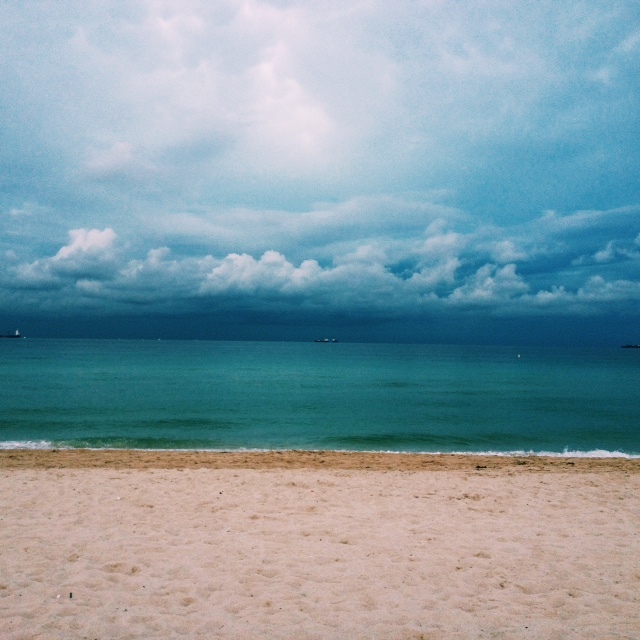 So yesterday, I set out to find joy in Miami’s simple things. Writing that seems silly, because there really isn’t anything simple about Miami. Yet, what I found the most joy in yesterday was colors. Bold, bright, beautiful colors. 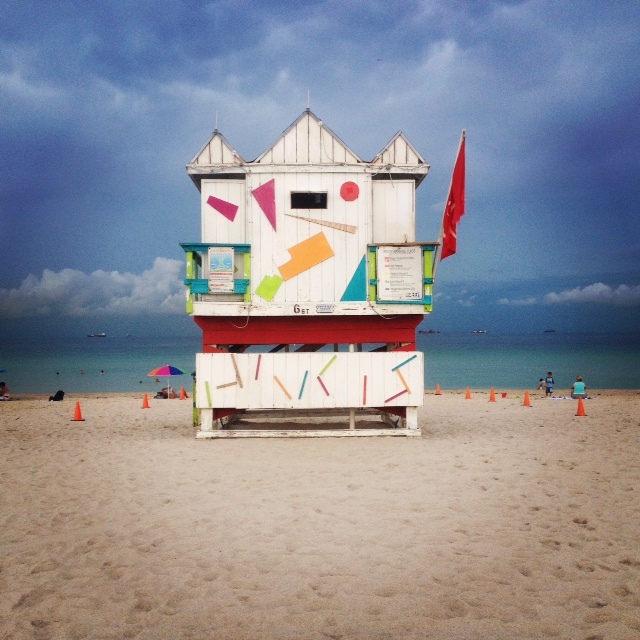 South Beach, in all of its art deco awesomeness, is home to the most amazing lifeguard towers on the face of Earth. Granted, I haven’t seen all of the lifeguard towards spread across Earth, but I’m pretty sure these take the cake. I started on 10th and Ocean and walked north on the sand. And at each block, I was met with a new design and new colors. And I was joyful. I was joyful for creativity and excitement and risk. I was reminded that living is about all three. You can’t have one without the other. 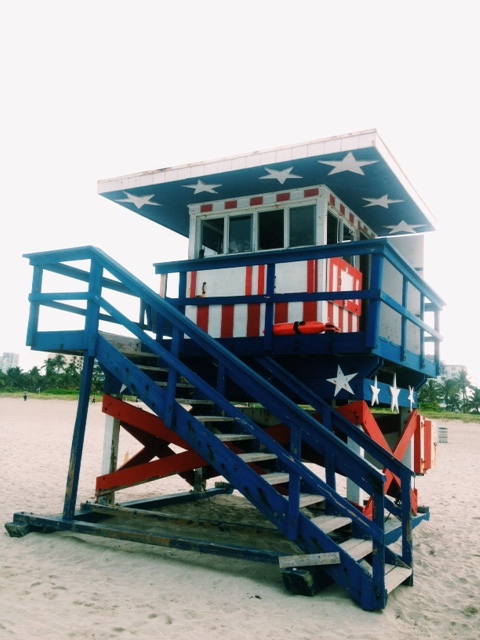 Ever seen an American flag inspired lifeguard stand? Well, now you have. 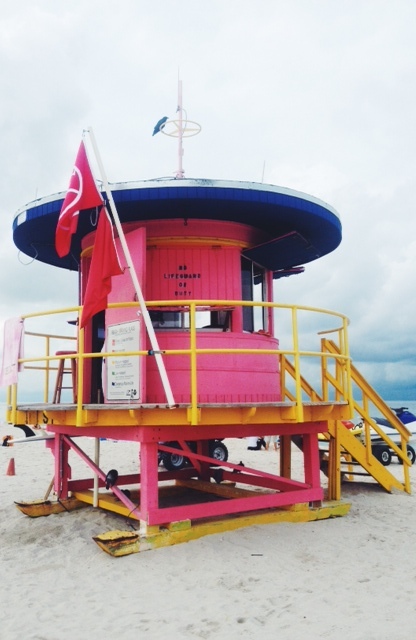 There’s joy in that lifeguard stand, people. It stands there in all of its gaudiness and causes you to feel joy in recognizing that someone decided that was a great way to honor our country. It surely was great. And creative. And exciting. And risky. What I’ve learned about finding joy, is that joy is made of layers. There are layers of big things, like trips to the Super Bowl and Greece. There are layers of moments, like falling in love, first kisses and butterflies. Then there are the layers of what otherwise could be seen as mundane, like falling in love with your home, making it your own and turning it in to your own little paradise. The colors in this picture, though. Seriously. I still can’t believe I captured this on an iPhone. I guess it’s no surprise that joy is made of layers. Joy is found in the world. And the world is made of layers. Sand and sea and sky. Each of them carries their own joy; their own way of doing what they need to do to make the world go on as it should. The other thing I’ve learned about finding joy, though, is the most important. The most important thing I’ve learned about finding joy is this: Joy eludes no one who seeks it honestly and authentically. If you want to find it, it’s there. And you don’t need to look hard. It’s in the sky and sea and sand. It’s everywhere. It’s in us. And it’s for the taking for the people who want to find it.